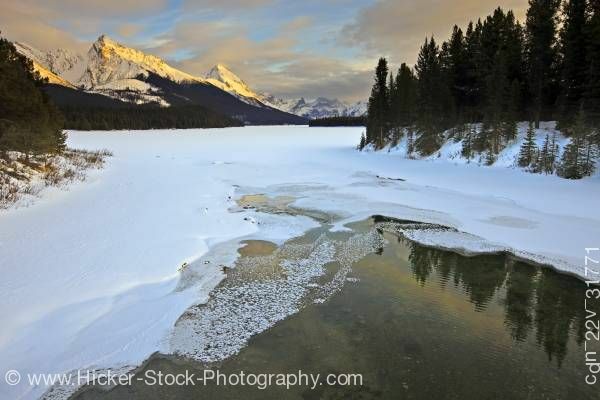 This stock photo shows a partially frozen Maligne River as it drains from Maligne Lake during winter with a view towards the snow capped mountains of Leah Peak (2810 metres/9220 feet) and Samson Peak (3077 metres/10095 feet) during sunset, Maligne Lake Road, Jasper National Park, Canadian Rocky Mountains, Alberta, Canada. Jasper National Park forms part of the Canadian Rocky Mountain Parks UNESCO World Heritage Site. The frigid waters of the Maligne River rarely surpass a few degrees above freezing, but despite its chilly nature, the stretch between Maligne Lake and this pullout represents one of the provinces most popular rafting destinations.